Over 1300 teddy bears that had their stuffing knocked out of them were treated at the annual NUI Galway Teddy Bear Hospital on Thursday 18 and Friday 19 January. Organised by NUI Galway’s Slainte Society who spent nearly a year preparing for this year’s event, children from over 28 schools across the county presented at the A&E department set up in the Bailey Allen Hall. Nearly 350 student volunteers from various courses gathered to treat the children’s poorly furry friends, while helping them understand the healthcare system and teaching them to be less afraid of hospitals and doctors’ offices. 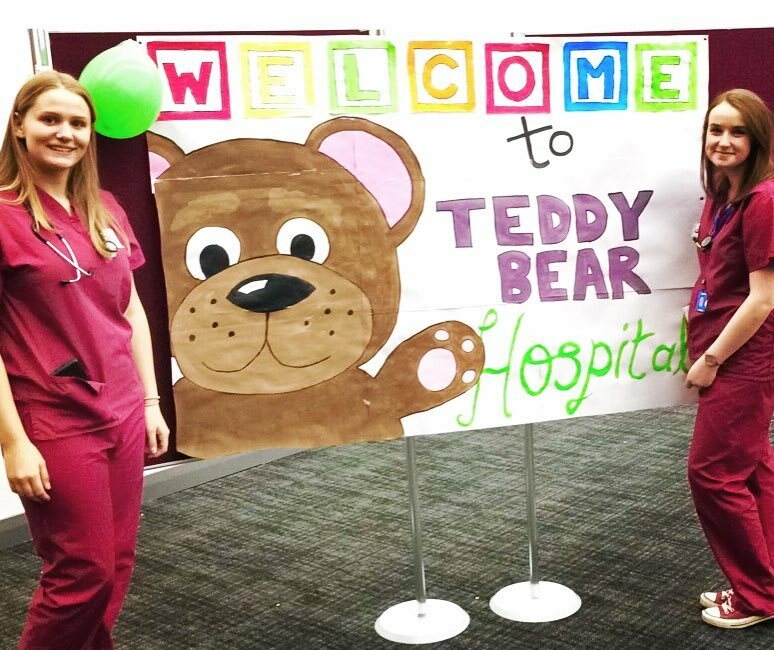 With appointments from 10am-1pm each day, the concerned children were taken to the waiting room to await their visit to the consultation area, where they were greeted by their personally assigned Teddy Doctor. The children were encouraged to hold Teddy’s hand and were rewarded for minding their stuffed friend. Teddy may have needed an injection, a plaster, or perhaps even an elaborate ‘pawscription’ from the in-house pharmacy, supplied with healthy fresh fruit from Fyffe’s and Burke’s Fruit and Veg – who sponsored the event alongside the Medical Protection Society of Ireland. The doctor explained to the child exactly what was wrong with Teddy and what needed to be done to fix him, be it a broken paw, a sore tummy or even a broken heart. The children could even listen to Teddy’s heartbeat with their doctor’s stethoscope. The doctor then brought Teddy for an x-ray in the handmade machines and fixed him up. The relieved children got to enjoy face-painting and a bouncing castle to finish up the day. Co-auditor of Slainte Society Liezel Ravenscroft said that while the planning for the event may be a massive undertaking, it was always worth it. “Even though we’ve been planning for this since last year and the few days leading up to the event can be hectic, there’s nothing like seeing the belief and amazement in the kids eyes,” she told SIN. On the night before the event over one hundred volunteers helped set up the Bailey Allen performing various duties such as setting up the tin foil x-ray machines or drawing chalk x-rays. “It’s great to get involved in and it’s not just for medical students, it’s for anyone that likes to help kids and we’re lucky to have such great sponsors every year and willing volunteers,” Liezel said.